The 13th World Firefighters Games will be held in Chungju, North Chungcheon Province South Korea from 9/10-9/17. Come and enjoy the festivities. A close friend is organizing and participating in the games and we’ve been invited to attend as well. Hope to see you there. Foreign language translation section added. Series followers Tu Pham and Weronika Wiktoria Hain will be providing translations in Vietnamese and Polish, respectively. Please visit the Languages section for a preview. Showcase your services or products with Easy Korean followers! We have a growing audience on Facebook, Pinterest, Tumblr, and Twitter. We’re #64 on Amazon’s top list of phrasebooks. An Illustrated Guide to Korean: Essential Words and Phrases is #64 on Amazon’s List of Top Phrasebooks. We’re thrilled by this as Korean phrasebooks represent a fraction of the global language books. Note: The ranking changes frequently but hovers in top 50-60. The picture reflects #64 when I grabbed a screenshot. 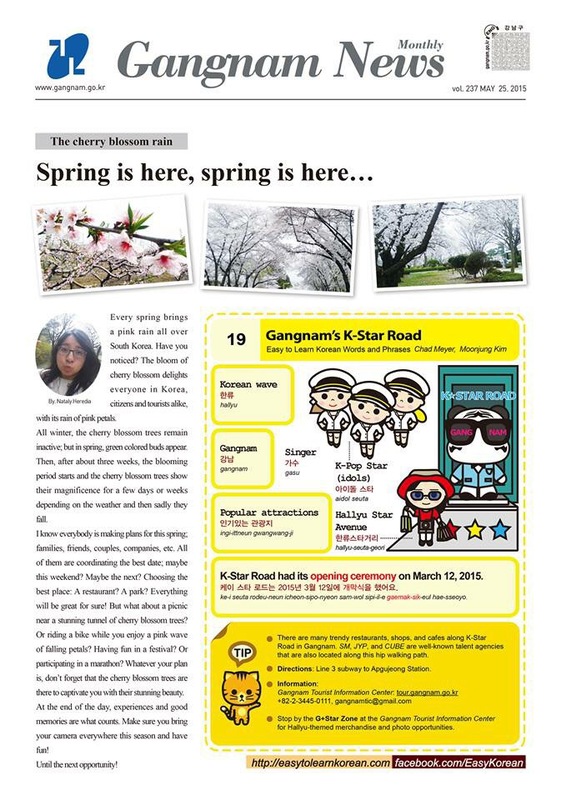 Here is our K-Pop cover story for the May issue of the Gangnam News.